On this page we will discuss Simple Video Pro a very powerful video player designed by and for marketing professionals. We’ll also discuss Camtasia Studio, a very popular video editor available bundled with Simple Video Pro at a huge discount. At the same time we are demonstrating another awesome product called VidEngage. Watch what happens as you scroll down the page and the Simple Video Pro video scrolls out of sight. Glance over to the bottom right of the page. There you’ll see the video continues playing in a smaller window. This neat trick is VidEngage in action. Be sure to read our review of this cool product too. So scroll down and start the video, then scroll some more and notice what happens on the lower right corner of the page. This is very cool! Simple Video Pro is much more than a simple video player. It is a complete video marketing platform. It is not a video editor, like Camtasia, for example, which is another essential software to have if you are serious about video marketing. I’ll have more to say about Camtasia below, but first lets talk about Simple Video Pro. Video marketing has been proven effective, capturing audience attention and facilitating audience engagement. Simple Video Pro, takes video marking to the next level. SVP features proprietary technology that makes it easy to present interactive and responsive videos to your Internet audience. Create videos with Explaindio, Easy Sketch Pro, Video Maker FX, or even in Microsoft PowerPoint or Apple Keynote. Or simply work with videos created by others and available on YouTube. Either way, Simple Video Pro 2 allows you to embed videos on your website and choose how they are displayed, viewed, and controlled. These can be YouTube videos, or self hosted videos you might host on Amazon S3, etc. With Simple Video Pro you can more effectively and efficiently monetize videos. Watch the following brief video to learn more, then take action by clicking on the yellow button below. Nick LaPolla was very instrumental in the successful product launches of Video Maker FX and Explaindio, both introduced during 2014. His interest in these video creation products was they both serve as perfect compliment to his own product, Simple Video Pro, which is a powerful video marketing platform. In this second video, just 4 and a half minutes long, Nick gives some further insight into this perfect marriage and the power of Simple Video Pro. With the “Play-in-View” optional feature enabled, your video will start playing automatically when it scrolls into view, and will pause when it scrolls out of view. This enables you to help insure your viewer is paying attention to the video, and not scrolling through your sales letter. This feature is also handy if you have multiple videos on your page. This prevents confusion and interference when audio from two different videos are trying to play at the same time. It also helps insure none of your videos are missed as someone scrolls through your page. Simple Video Pro allows you to choose from among 15 responsive frames. Being responsive means your videos will resize automatically on mobile devices, or based upon the window size on your viewer’s computer. You can even create your own frame using CSS. With Simple Video Pro you can even insert your videos into widget. Simply drag your video control into the widget area. You can determine whether your video will appear on all pages, or select from a list of your pages. Simple Video Pro facilitates turning YouTube Videos, or other videos of your choosing, into cash machines to generate income. Timed PayPal button – have your PayPal button appear at the precise time within your video that you specify. Timed banner ad – have a banner ad appear within your video at will. Add your own logo or watermark into your videos, and control both the timing and position. Redirect your viewers automatically to a specific URL at the end of your video. If you have an affiliate site, for example, create an explainer video or product demonstration video, then redirect the viewer automatically to your affiliate link. Or find just the right videos on YouTube instead of creating your own, then embed them on your site and personalize them using with your own links. Simple Video Pro is integrated with Aweber, Mailchimp, and GetResponse, and is compatible with other autoresponders as well. Embed email opt-in forms, newsletter subscription forms, or report give-aways into your videos, either at the end, or at a specified time within your video. You can even play part of your video, then require an opt-in or social media engagement to continue playing the video. Another neat feature allows you to hide website content until a specified time in the video. Reveal site content, buy buttons, opt-in forms, or even links to other videos at just the right moment during the play of your video. Simple Video Pro generates video site maps and video rich text snippets for your videos, that provides Google with pertinent information about your videos, telling Google’s spiders what your videos are about. SVP also takes advantage of Social Media, with Facebook Open Graph. Facebook Open Graph tags give Facebook and Google specific information about your pages and videos. You will be able to set a custom Facebook icon, site name, and description for each page and video that will display for likes and comments, helping your videos to go viral for social media marketing. Recognizing the quality of Camtasia, and its high value for Simple Video Pro customers, SVP creator Nick LaPolla and his partner Aon Thompkin negotiated a sweetheart deal to bundle Camtasia with Simple Video Pro. Normally priced at $299 by itself, you can get Camtasia and Simple Video Pro together for as little as $319. That’s like getting SVP for $20.00 — or getting Camtasia for as little as $160, depending upon your perspective. 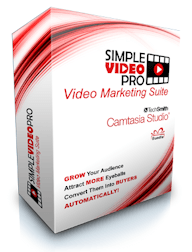 Either way you look at it, the Simple Video Pro & Camtasia Bundle is a genuine bargain.